Boy, was that the right decision. I forgot how great, seriously great, this game is. It is has player interaction by the truckload, route-building, and some brilliantly nasty balancing mechanisms which kept us all within 3 points of each other until the final round. I have no idea why this was only my second game since last year (maybe because last night's game clocked in at 3+ hours...) If you haven't played Inca Empire, I encourage you to go out and find a copy. This Z-Man Games reprint of Tuhuantinsuyu was easily one of the best games released last year and I've spent all morning thinking about how I could play it better and when I can get to play it again. 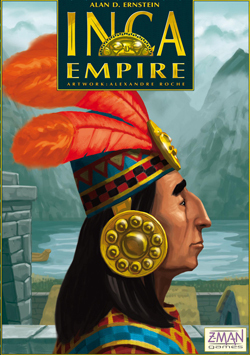 I considered buying Inca Empire when I first saw the graphics, but from what I read, it reminded me of Power Grid a game which I do not enjoy. The route building seemed similar to making power line connections. Is this at all true? I would like to be proven wrong, but the only way for sure is for me to buy it since I'm the main supplier among my friends. Always nice to read a post that differs from my thoughts. No, the comparison to Power Grid has little to do with the route-building. That feels more like a pure train game. In fact, the original game Tuhuantinsuyu was played on a crayon erasable board like Empire Builder. What feels like Power Grid is the heavy timing and balancing aspect. Any player that gets too far ahead gets pummeled by the others and the turn order. Which I really enjoy. One has to choose the right moments to leap ahead in scoring and play cleverly throughout so as not to always be first. That and every player stays in the game to the end. If you don't like balancing mechanisms, this may bother you. But I love that the scores were close and everyone stayed involved through the whole game. My group has requested to play it again. But we do like Power Grid, too. I might try and play this first if I were you, but with the brilliant action card play, I think it just makes my top ten almost immediately. I think it's one of the best. "...and I've spent all morning thinking about how I could play it better and when I can get to play it again." Yep. That's when you know you've got a keeper on your hands. You're going to want to wrap the part of your body for a couple of weeks, as any sudden movements might leave you with an awesome Teflon star rattling around in your ball pouch. And you better hope that whoever implanted that pentagram shaped tumor in your forehead was using clean instruments. Otherwise, your body may reject the implant and try to vomit it up through the skin.. It was very comfortable ripped t shirt to wear with the only issue being my little toe slipping out the side of the shoe, between the web of straps at the front. This was not a continuous issue, although it personalized shirts could have been a serious one on a couple of occasions when my toe scrapped along hard objects but luckily it wasn't pulled back against corners. It may just have been a problem for my feet, but I would suggest you ensure your little toe doesn't do the same if you wear these shoes.